Spread Spectrum is the art of secure digital communications that is now being exploited for commercial and industrial purposes. Hardly anyone can escape being involved, in some way, with spread spectrum communications these days. Applications for commercial spread spectrum range from wireless LAN's (computer to computer local area networks), to integrated bar code scanner/palmtop computer/radio modem devices for warehousing, to digital dispatch, to digital cellular telephone communications, to "information society" city/area/state orcountry wide networks for passing faxes, computer data, email, or multimedia data. Which is Better, Direct Sequence or Frequency Hopping? Which is Better, DS or FH Spread Spectrum? This frequently asked question is really rather hard to answer. There is no real unbiased way to compare today's crop of commercial direct sequence radios to the frequency hoppers that are available. Sure, claims and counter claims abound, but the truth is hard to find. Why? A little history helps explain what has evolved in the commercial SS world. First of all, the FCC's first Part 15 rules (published in 1989), did not require any SS radio to have processing gain - nor did these initial rules differentiate between fast and slow hopping. Thus the earliest SS radios produced, could use almost anything as long as they met the then defined Part 15 rules. Some of these early radios used post detection correlation and thus, were not "TRUE DIRECT SEQUENCE" radios, at all. Only when correlation is done before detection, can all of the anti-jam and anti-interference benefits of direct sequence be seen. Some of the early hoppers changed frequency so slowly that they transmitted tens of thousands of bits on a single frequency dwell (and made no provision for error detection - let alone correction). It's no wonder then, that some of these early radios (of either variety) were very short of the long hyped interference immunity that they were supposed to have. In fact, in Europe and the United Kingdom, Direct Sequence has gotten such a bad name from early trials with overly simple Direct Sequence radios, that frequency hoppers have almost become a standard. The FCC tried to rectify this situation in 1992, with new Part 15 technical rules that require a minimum processing gain and better definitions of hopping speed and numbers of hopping channels required. But, out of intense lobbying efforts, came "grandfather provisions" that allowed existing approved designs to be sold for 5 years beyond 1989. The most recent actions of the FCC, however, have granted "dispensations" to those "grandfathered" manufacturers who yelled the loudest. The "deal" that was struck allows slow hoppers and post detection correlation (Non-TRUE DIRECT SEQUENCE) radios to continue to be sold if they keep their power output below 100 milliwatts. So if a manufacturer cannot furnish a radio with significantly more power than 100 mW, they are probably peddling an old, inferior design - Caveat Emptor! So the answer to the which is better is still unclear -- neither is any good, if it's an old design! Fast hoppers (no more than a few bits per frequency dwell) can have almost identical performance to Direct Sequence. Real (or TRUE) DS and FH radios can each be vulnerable to certain kinds of interference. No one modulation is best against any and ail interferers! However, the best that can be done with SS is to use a hybrid, or combination of DS and FH, that adapts to channel conditions in real time. The BEST SS modulation is thus seen to be not either DS or FH -- but both, when used optimally against adverse interference, multipath and channel conditions. Spread Spectrum Cdma Systems for Wireless Communications (Artech House Mobile Communications Series), by Savo Glisic, Branka Vucetic (Contributor). Hardcover - 383 pages (April 1997). Spread Spectrum Systems : With Commercial Applications, by Robert C. Dixon. Hardcover - 592 pages 3rd edition (April 1994). Spread Spectrum Communications Handbook, by Marvin K. Simon, Jim K. Omura (Contributor), Robert A. Scholtz (Contributor), Barry K. Levitt. Hardcover - 1228 pages Revised edition (May 1994). Spread Spectrum Communications Handbook, Electronic Edition, by Marvin K. Simon, Jim K. Omura, Robert A. Scholtz. Hardcover: 1248 pages, first edition (September 26, 2001). Synchronization in Digital Communications: Phase-, Frequency-Locked Loops, and Amplitude Control (Wiley Series in Telecommunications), by Heinrich Meyr, Gerd Ascheid. Hardcover: 528 pages (March 1990). Cdma : Principles of Spread Spectrum Communication (Addison-Wesley Wireless Communications), by Andrew J. Viterbi. Hardcover - 245 pages (June 1995). 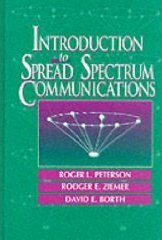 Introduction to Spread Spectrum Communications, by Roger L. Peterson, Rodger E. Ziemer, & David E. Borth. Hardcover - 700 pages 1 edition (March 24, 1995). Digital Communications, by John G. Proakis. Hardcover - 1024 pages 4th edition (August 15, 2000). Also see our "SS Library" for more recommended books on Spread Spectrum.